This was the introduction text from this year’s BA Design degree show catalogue at Goldsmiths. The basis of this text was a conversation between myself and Laura Potter. The intro is authored by both of us. 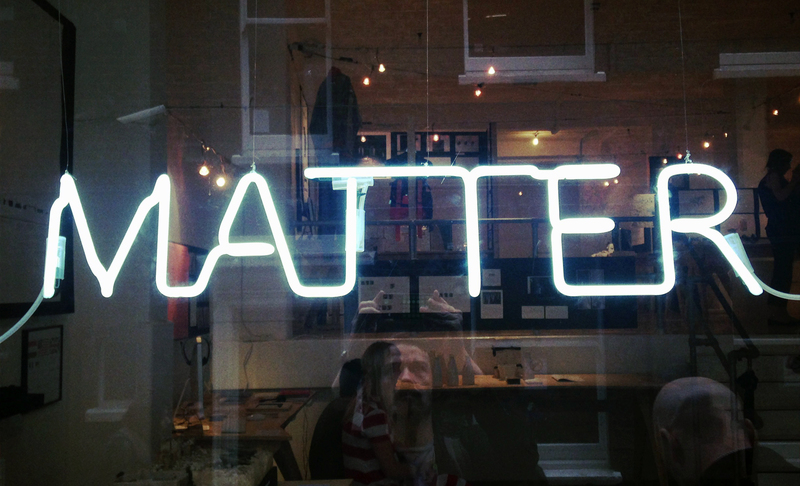 MATTER – the title of this year’s degree show – may be read in different ways. Depending on what you put with it, the word can be moulded and manipulated towards different meanings. It spans the ideological and material, the conceptual and the practical, the idea and the thing. It acts to join these often (falsely) disjointed entities; highlighting how materials act in the world. Within the humanities there has recently been a ‘material turn’: an acknowledgement that MATTER is not inert, not waiting for humans to activate and act upon it: it has agency. As Jane Bennett describes in her book of the same title, it is Vibrant Matter. This year’s show is full of vibrant MATTER, ready to move out into the world and change it. What these students have experienced, and what we do here at Goldsmiths, MATTERS. This interpretation, which places importance on the process and ultimate aim of education, is especially significant. As a teaching team we are aware that there has been a gradual ‘dematerialisation’ of design across the programme. For years we have been trying to understand how to dematerialise, how to de-emphasise the ‘shiny product’ at the end of the process, in order to grant the designer a different kind of power. Initially, we prioritised the abstract. We did a lot of thinking, a lot of talking and the making came at the end as a synthesis of what we were trying to understand. It was an attempt to make the ‘shiny things’ more thoughtful. However, what staff and students have come to understand is that the value of design happens in the stuff – in the MATTER – and that it must be part of the process. We believe that ‘design thinking’ should not exist without ‘design making’. In the early years of the course we had students who suffered moral crises. We encouraged a ruthless questioning of what design should be, and some came to the conclusion that designers are responsible for perpetuating levels and patterns of consumption. These students decided they did not want to be designers, because they did not want to make MORE MATTER. What we now know is that the material investigation does not need to come at the end: it is not necessary to move towards a ‘product’. The making of stuff, the realising of ideas in three dimensions, can be part of a process that helps us understand, change and eventually take action. A design outcome might be immaterial, but you can still be a designer in the way you approach the world. Of central importance here is the idea of ‘thinking through doing’ or ‘thinking through making’. These students have attempted to investigate and articulate the complex significance of contemporary MATTER. What they hope to demonstrate is that when design ventures deep into abstract territories, when designers move beyond the goal of the ‘shiny object’, they can generate valuable insights by engaging with all manner of MATTER(S). We are not limited to post-it notes.